SOUL OF SYDNEY: TRUST THE DJ! THE ARE PROFESSIONAL BODY MOVERS ! | SOUL OF SYDNEY FEEL-GOOD FUNK SOUL DISCO vibes & beyond. SOUL OF SYDNEY: TRUST THE DJ! THE ARE PROFESSIONAL BODY MOVERS ! 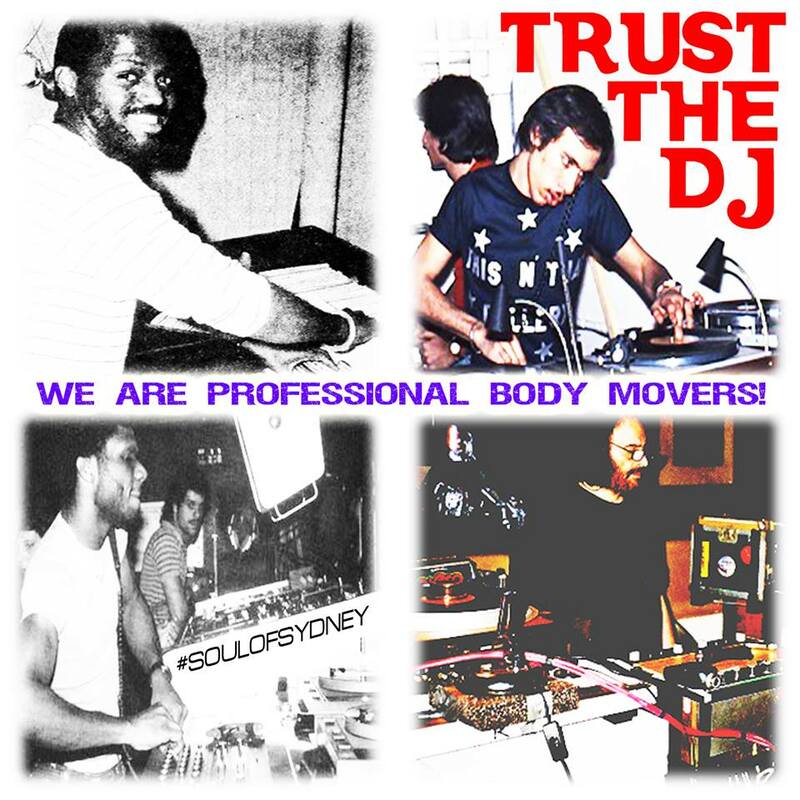 TRUST THE DJ : THEY ARE PROFESSIONAL BODY MOVERS who we entrust to move your arse and your soul at Soul of Sydney! We are sending a special shout out to the fine selectors that have played at our jams over the last 2+ years, they definitely don’t get the props they deserve these days. With 30 parties now under our belt, our wobbly turntables have hosted some of the craftiest local DJ’s around, these cats are the unsung hero’s of Soul of Sydney who actually own those amazing Block Party moments you see in photo’s and videos. Those rare dance-floor moments you see online and at the parties, they don’t just happen.. they are carefully crafted by the DJ’s with years of experience and musical knowledge. Their musical selections at our jams builds and maintains that positive party vibe. No matter what style they are throwing it down, from Soul to Funk, Disco to House, is always about that ‘feel-good’ & funky feeling, music to move your BODY & music to move your SOUL, keeping it true to the party ideals of DJ Godfathers like Larry Levan, Frankie Knuckles, Nicky Siano, David Mancuso. RESPECT TO EACH AND EVERYONE OF THE FINE SELECTORS! We are truly blessed to have such an eclectic bunch of talented DJ’s on board. THANK YOU EACH AND EVERYONE OF YOU FOR MAKING THE LAST 2 YEARS SO BLOODY MEMORABLE.